An easy recipe for 6-ingredient granola cups that can be served at breakfast or for snacks and filled with whatever you like! 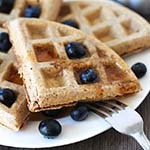 You know when you’re looking for something a little fancier or different than the usual stuff to serve at breakfast or a brunch or even to serve to your kids for a change from the usual snacks? 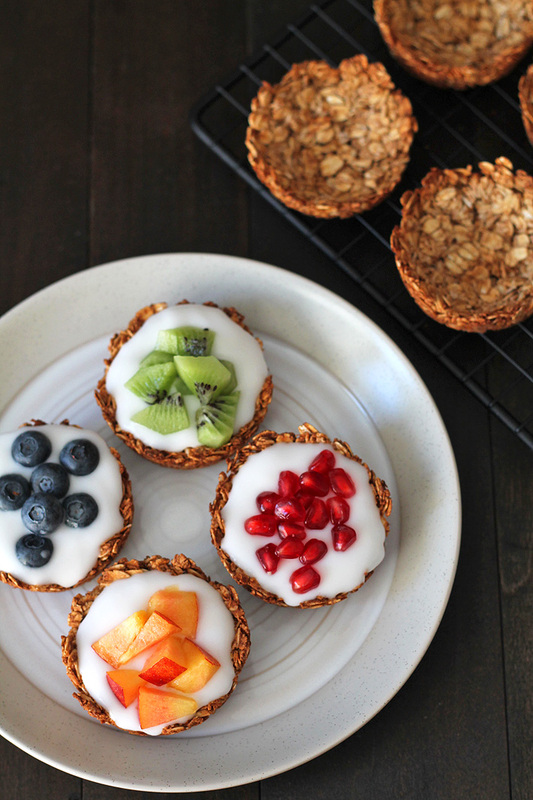 These cute little fruit and yogurt granola cups are perfect for those situations. The nice thing about them is that you can top them any way you like. 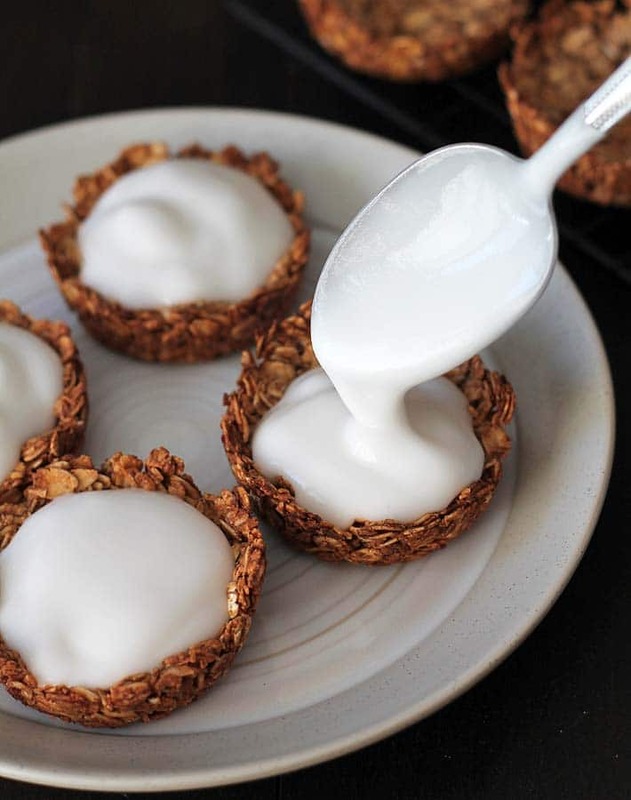 I have a particular vegan coconut yogurt that I’m a little obsessed with (that’s what I’ve filled the granola cups in the pictures with) that I always use as the filling. However, they will be perfectly delicious with whatever yogurt you prefer. And for the fruit, you can use whatever you have on hand and what’s in season. Right now, it’s the middle of January, so I had to go with what I could find at my grocery store and what they had didn’t end up being so bad, as you can see. Summer time offers a whole beautiful range of berries and other fruits that would match perfectly with your granola cups. Strawberries, cherries, peaches, raspberries…so many options! And they’re so easy to make. Just 6 ingredients and you’re set. As you’ll notice, almond butter is one of the ingredients, but don’t be hesitant about that. Since almond butter is much milder in taste than other nut butters like peanut butter, your granola cups will not taste like almond butter at all. In fact, I don’t detect any almond butter taste when I have these. The almond butter is used more for structure than taste. Once the cups have cooled off, be careful when removing from the muffin tin, or they can crumble. When they come out of the oven, the outer edges will already be crispy, but the entire cup will crisp up even more as they cool. 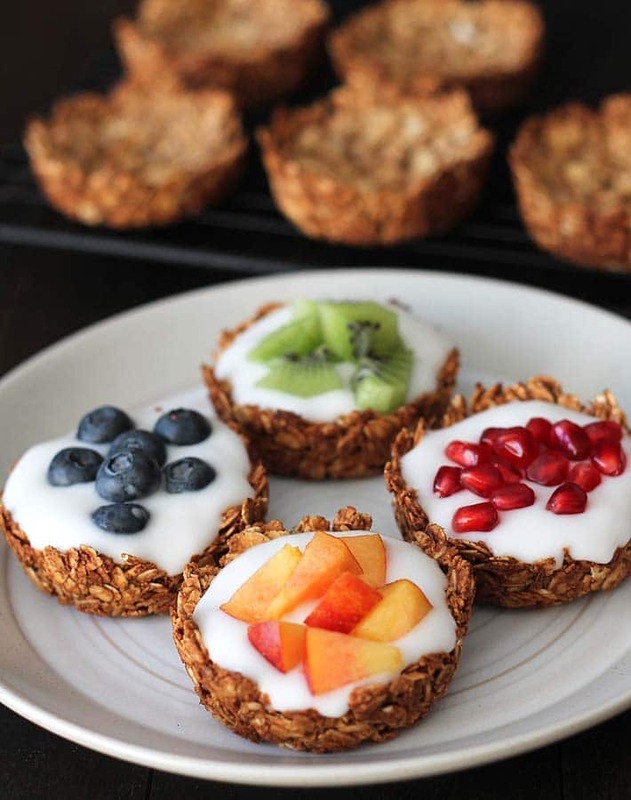 Be sure to let them your granola cups cool off all the way before attempting to fill them or they won’t have a chance to fully crisp up and they may end up soggy. If you’re not a yogurt fan, not to worry! You can still make these and fill them with something else, like avocado pudding, chocolate banana coconut chia pudding, or any other favourite pudding or dessert that would go great in a granola cup. Fill them up and top them with your favourite fruit or seed toppings! Get as creative as you’d like. 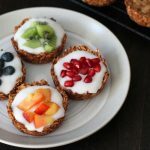 Easy-to-make fruit and yogurt granola cups that are great to have a breakfast, to serve at brunch or for snacking on. Plus, they can be filled with anything you like, not just fruit and yogurt! Lightly grease 9 muffin cups in your muffin pan. Parchment liners can also be used. In a medium-sized bowl, add rolled oats, shredded coconut, ground cinnamon, and salt, mix together. Add maple syrup and almond butter to a small pot on low heat. Whisk together until warm and both ingredients are runny and have combined together. You don't want the mixture to be hot, just warm. Add almond butter mixture to oat mixture and stir to combine. Be sure the all of the oats have been coated with the wet mixture. Divide mixture evenly among the 9 muffin cups. 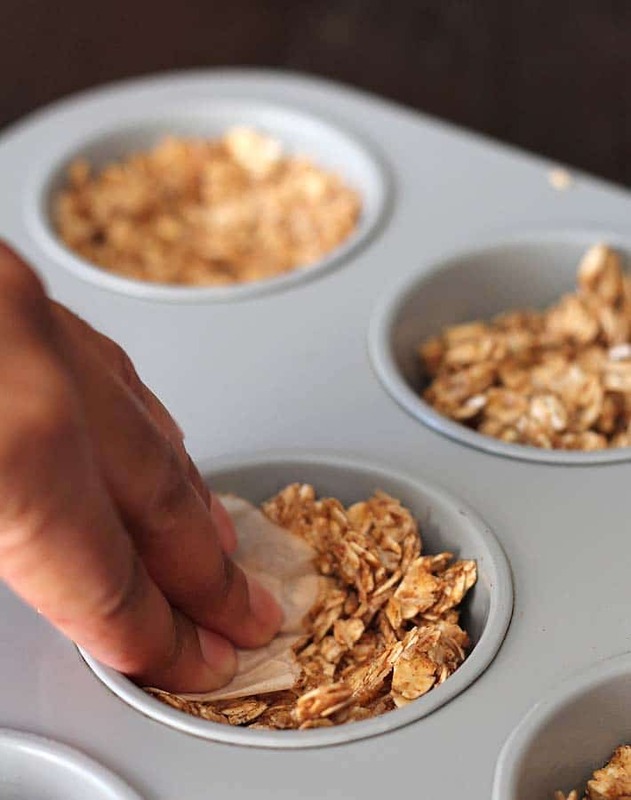 Using a small piece of parchment paper (see picture above), press oat mixture into the bottom and up sides of each muffin cup. The mixture does not have to come all the way up the sides of the muffin cups. Be sure that there are no gaps or holes on the bottoms. Bake for 15 minutes or until edges are golden brown and crisp. 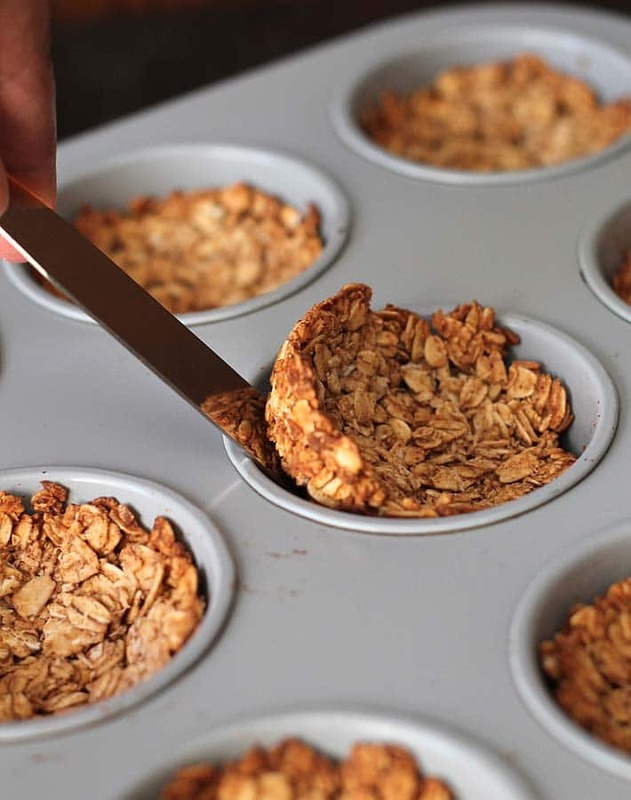 Allow granola cups to cool completely in muffin pan. Once cooled, carefully remove by using an icing spatula or a butter knife (see image above). Do this gently to avoid having the granola cups crumble. Fill with your favourite yogurt and top with the fruits you have on hand. 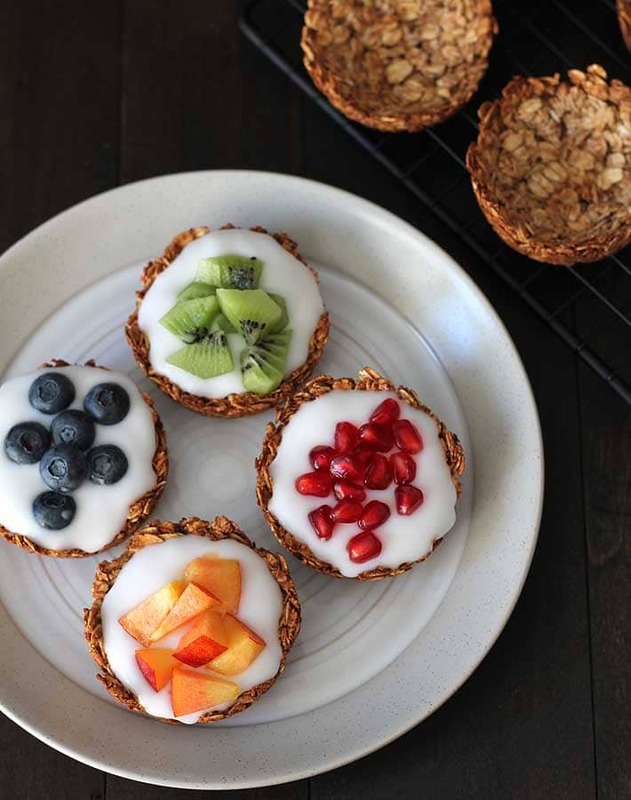 Granola cups can also be filled with other soft desserts such as avocado pudding or chia pudding. Be sure to use natural smooth almond butter that has no sugar, salt or any other flavour or additives added to it. You want the almond butter that has just one ingredient listed in the ingredient list: dry roasted almonds or roasted almonds. My favourite yogurt to use is vegan cultured coconut, it goes perfectly with the granola cups. Store uneaten granola cups in an airtight container. They will stay crunchy for 3-4 days. 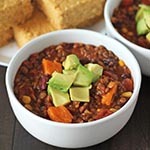 Adapted from this recipe in "Cooking Light" magazine. Nutrition info is for 1 granola cup with no filling and is only to be used as a rough guide. Total count for filled cups will vary depending on the type of yogurt and fruits you use. 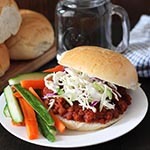 Click here to learn how calorie counts are determined on this website. What kind of shredded coconut do you use? Is it the sweetened shredded kind, or the unsweetened flaked kind? Or does it not matter? Thanks!